For Spring Summer 18 Menswear and Womenswear are unified, inspired by the epic adventure and journey of the riders of the Paris Dakar rally. Travelling through extreme conditions, it was in these uncharted territories that riders encountered many different cultures, climates and terrains which translates into the collection, mixing modern performance fabrics with retro sports graphics and prints. Taking inspiration from the late 70s and early 80s era, the rally was less about the race and more a voyage of self-discovery, with riders needing courage and fortitude to complete the journey, never knowing what was to greet them around the next corner. This sense of the unpredictable is very much represented in this collection, rich in multi-seasonal technological innovation, mixing luxurious fabrics and bold prints with functionality. The many countries and terrains the rally passed through provided the perfect inspiration for Belstaff to showcase new modular, lightweight and highly technical styles that are protective and wearable in all climates. 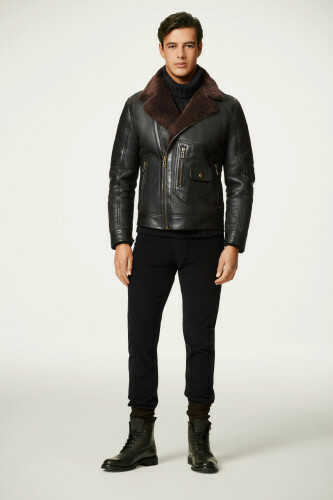 “The pioneering spirit of Belstaff’s founder Eli Belovitch can be seen through the developments in this collection in the new technology used, in the fabrics and construction. Our iconic outerwear continues to evolve, with classic silhouettes reinterpreted for the modern consumer, and new styles showcasing the modernity of the brand. The collection also celebrates a more graphic and bold colourful offering for the summer season,” explains Creative Director, Delphine Ninous. The collection also captures the romance of the North African landscape through a colour palette ranging from soft sun-bleached pastels to the bold hues of copper and burnt orange. A sense of spontaneity is projected, with patterns and prints juxtaposed with retro-inspired sportswear, and of Western clothing influencing and being influenced by African colours. Belstaff showcased the collections in the iconic London venue of Somerset House, in the newly opened wing, the Lancaster Rooms, with guests arriving via the British landmark of Waterloo Bridge. The raw and dilapidated space with high ceilings and original arched windows is juxtaposed with modern shards of block colours, evoking the graphic nature of the collection while the conceptual sand dunes of the African landscape provide the setting for the model vignettes. “Through Delphine’s new leadership as Creative Director we are proud to showcase the modernisation of our incredible, iconic and British heritage brand. Focusing on innovation, functionality, colour and new materials Delphine delivers a strong aesthetic interpretation of the brand into product, respecting our great 93-year history but always looking forward, designing for our global modern urban adventurer”, said Gavin Haig, CEO Belstaff. This season’s palette is rich with the warm and earthy tones of the lands of North Africa. As if viewed through a sepia lens, hues of sun-bleached sand, tundra and scorched earth represented by shades of brown, vibrant copper and saffron shift to stronger tones of the African sunset such as burnt orange and red. These warm and authentic colours are complemented with soft sage green, ash rose and blue chambray pastels. Sportswear takes its cues from the early 80s with solid blues, reds and yellows contrasting the softer shades of the collection. For Spring/Summer 2018, Belstaff has taken some of its most iconic pieces of outerwear – such as the Trialmaster and Roadmaster– and has evolved them with new fabric innovations to create trans-seasonal jackets that are at once incredibly lightweight, waterproof, windproof, breathable, moisture-wicking and UV protective. Much of the technical nylon outerwear comes unlined this season for lightness and ease of movement while still being impermeable to the elements. There is also a two-way stretch nylon, which provides unparalleled mobility and comfort in active conditions. Cotton-nylon blends and a new ripstop fabric reiterate the very modern and versatile developments in outerwear this season. Furthermore, laser cutting techniques on pockets and rubberised snaps have been used to create an incredibly modern look, complemented by bonded seams and waterproof zips, both adding a graphic element to the heritage silhouettes. A Prince of Wales check coat has also been rendered in technical nylon rather than traditional wool for a very modern and multi-seasonal take on a classic pattern. A lacquered nylon mack in both black and tan completes the contemporary elements to outerwear. The heritage waxed-cotton styles have been given a much lighter wax treatment for the summer, too. Belstaff is also extremely excited to introduce the very first few iterations from its new Origins concept, a highly technical and innovative reimagining of Belstaff’s most iconic pieces for the active modern lifestyle. Origins will be the vanguard of performance fabric technology. The washed-out colours of the North African landscapes have been beautifully imagined in this season’s leather offering, from tea rose and off-white to tan, red and burnt orange. Belstaff’s heritage moto detailing features strongly in the cross-stitched padded shoulder panels and elbows, while this season also sees the introduction of an embroidered phoenix logo. New crinkled and burnished leather finishes with a vintage feel have been introduced to a leather collection that is altogether lighter for the summer. The lightest of these is a new travel leather and nylon blouson for men and women that has been lined with mesh to create an easy-to-wear and easy-to-care for jacket, while a perforated bomber in both nubuck and hand-waxed leather offers more trans-seasonal pieces. Classic silhouettes have also been evolved this season, specifically a new oversized biker-style blouson for women. The early Paris-Dakar rallies occurred in the heyday of big advertising and sports sponsorship, a fact which inspired Belstaff to literally think big in terms of graphics and prints this season. The Belstaff name and Phoenix logo is writ large across leather, jerseys and knitwear while a classic motocross racing stripe is to be found in various guises across the whole collection, from a satin red bomber jacket to leather blousons, tracksuits and sneakers. In women’s prints especially, there is a strong sense of spontaneity and personalisation in the mixing together of patterns, from a delicate mosaic print to a more robust Prince of Wales check in nylon, while ruffle shirts show off a more feminine side to the collection. Across both menswear and womenswear, Belstaff has also incorporated a fun and bold Panther graphic to juxtapose with the more technical elements of the collection. For men, it will appear on leather while for men and women it will feature in both knitwear and jersey. This season, Belstaff has introduced stressing, patchwork and eyelet elements to the denim offering. Shirts come in beautiful indigo washes and in an off-white and grey stone-wash style. Jeans, cargo pants and cotton chinos reflect the seasonal colour themes and retain Belstaff’s tailored style. Sneakers provide a continuation of the the graphic story for Spring/Summer 2018 with a geometric interpretation of the motocross racing stripe featuring on both lo-tops and hi-tops. For men, a more literal interpretation of the rally’s journey across North Africa has been achieved through a desert boot with chunky lug soles while a classic Chelsea boot comes in a light pastel tone with a crepe sole. A notable feature of the women’s shoes is a subtle red piping detail in a nod to the racing stripe motif seen elsewhere in the collection. There is also a new printed python leather lo-top sneaker, while boots have been fitted with a double-prong buckle to complement the buckles of this season’s new Roadmaster and rider coats. Bags are in keeping with the season’s concept of lightweight technical fabrics. A messenger bag and small rucksack both come in a washed nylon and feature suede and leather detailing. They are perfect for modern urban living with a heritage style in mind. Also showcased is a selection of the newly launched eyewear range, which is available as a ‘See now, buy now’ offering, from Belstaff stores, online and selected retailers. The collection, a result of an ongoing licensing agreement with Imatta, is handmade in Japan using only the finest premium materials such as Beta Titanium, hand-waxed leather, Japanese acetate and Zeiss lenses.